5 Brides Who Did NOT Give A Damn About 'Log Kya Kahenge'! Shagun, apshagun, right, wrong, acceptable and unacceptable - the society has just so many things to say to a bride. Some people tend to listen to every piece of advice while others choose to ignore and do what they feel is right. And we believe that is how it should be! Here are 5 brides, who literally did not give two hoots about social standards and had no f**ks to give about log kya kahenge. Way to go, girls! Yes, for a photoshoot right before she walked down the aisle, this bride decided to pose like a boss bride. She put her denim shorts, sneakers and sass on, and posed away like no one’s watching! The pictures turned out looking fabulous, and that is exactly what matters. Yes, you read that right! ‘Hansika’s Baraat, Is baar dulhan bhi band-baaje ke saath aayegi,’ read a banner on the autorickshaw that drove Hansika to her wedding venue. 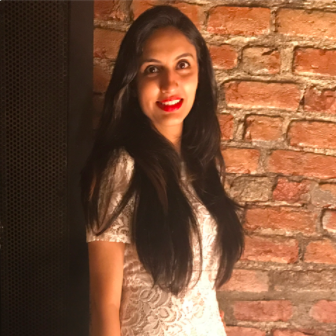 Hansika Chandiramani, founder of HC Media likes doing things a bit differently. 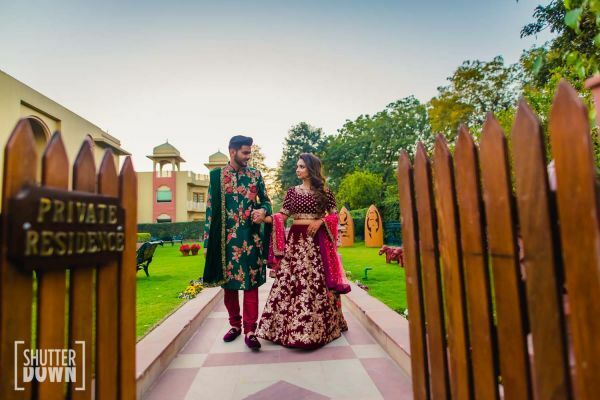 “I firmly believe that women are at par with men, so, why should the bride be stereotypically sitting in a doli, all coy, while the boy arrives in style?,” she says. A band of 6 women played the dhol as Hansika and her family danced their way to the wedding venue. 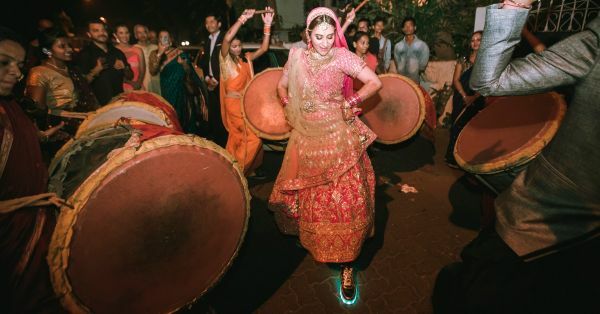 Dressed in a pink Malvika Talwar lehenga with LED sneakers, Hansika was actually hoping to cross paths with the groom's baraat so they could have a baraat-off! Now that is what we call a super chill and super badass bride. Kudos to her spirit! Another interesting fact about Hansika was that she got all her outfits on rent and even got her wedding functions sponsored! This was one unique wedding function. Read all about it here! We all know this bride by now, and somehow she still hasn’t faded out of our memories. The gorgeous bride danced to Cheap Thrills with her bridesmaids while getting ready on her D-Day. With her lehenga in hand, choli paired with a pair of shorts and style on fleek, she danced her way into our hearts. If you still haven’t watched her viral video, here it is! No pheras, no nikaah - this Hindu-Muslim couple decided to celebrate their love instead. Not only did they do away with all the rituals and ceremonies, they set an example of a couple who wasn’t afraid of declaring their love for each other, despite belonging to different religions. It didn’t matter to them, and they didn’t care about whether it mattered to the world or not! 5. The bride who was a total chiller! So what if she’s a bride, that doesn’t mean she’s not allowed to gulp a beer or two. If that is what helps her release some pre-wedding anxiety and stress, then so be it. This one didn’t care about log kya kahenge, and as long as you’re okay with it, you shouldn’t care too!